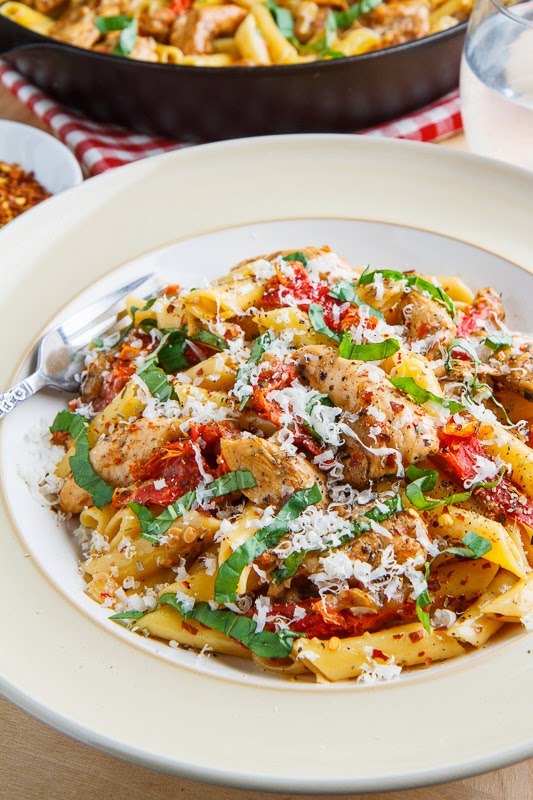 A quick and easy chicken pasta dish with a creamy sundries tomato sauce! 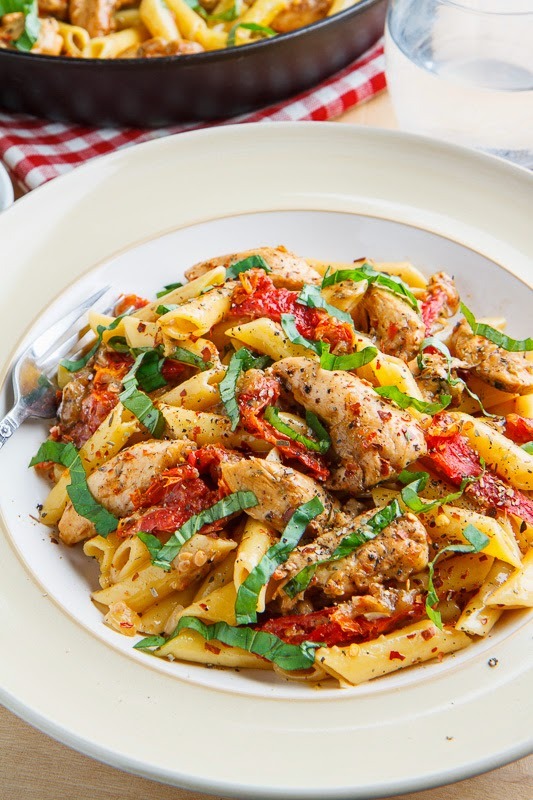 I have been seeing this tasty looking creamy chicken and sundried tomato pasta on pinterest for a while now and it was time that I made my own version of it! 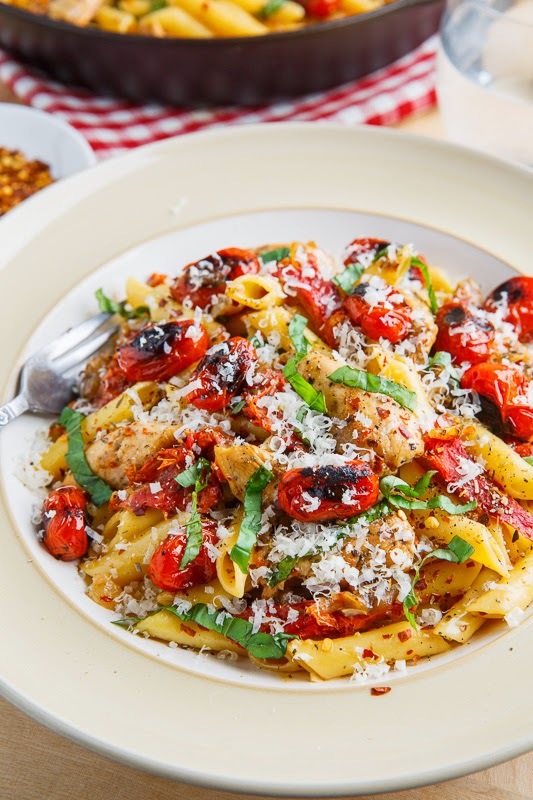 You really can’t go wrong with a creamy sauce packed with the flavour of sundried tomatoes but this pasta takes things a step further with the addition on plenty of melted cheese including both fresh mozzarella, which only adds to the creaminess, and parmesan! This recipe is super easy and it only takes as much time to make as it takes to bring the water to a boil and cook the pasta! You start off by cooking the chicken, deglazing the pan with some white wine, adding some broth and cream along with the sundried tomatoes and cheese and you’re done! Other than tweaking the recipe I made one important addition and that was to add some roasted grape or cherry tomatoes for their juiciness and acidity which complements and contrasts the creaminess of the pasta perfectly! As simple as this dish is it’s so wonderfully tasty that words just cannot describe how good it is, you really just have to try it! Meanwhile, heat the oil in a large pan over medium-high heat, add the chicken and cook until lightly golden brown on all sides, about 2-4 minutes per side. Add the garlic, red pepper flakes and sundried tomatoes and cook until fragrant, about 30 seconds. Add the wine and deglaze the pan before adding the broth and cream and brining everything to a simmer. Reduce the heat to medium-low, let the pan cool, mozzarella, parmesan and dried basil, and stir until the cheese melts, about 3-4 minutes. Remove from heat season with salt and pepper to taste, mix in the pasta along with enough of the reserved pasta water to make a nice and creamy sauce before, adding the fresh basil. Option: For One-Pan: Make this a one-pan meal by adding the pasta and 2 1/4 cups broth or water (or 1 cup of rice and 2 cups broth or water) to the sauce after step 4 and simmer, covered, until cooked, about 12 minutes (or 20 minutes for rice). Option: Replace the cream with half and half for a lighter version. Note: Both mozzarella and half and half will curdle (separate and form little white bits rather than being a smooth sauce) at high temperatures so you need to reduce the heat before adding them to the pan. The heavy/whipping cream will not curdle in this sauce at the higher temperatures. Option: Add roasted cherry or grape tomatoes, by roasting them in a heavy bottom pan until they blister and char, about 5-7 minutes, for the contrasting juiciness and acidity. 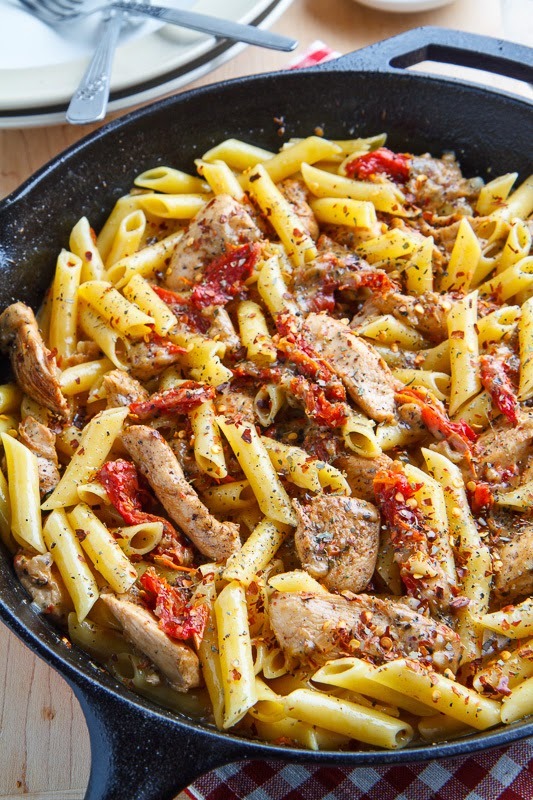 I love simple pasta dishes like this- it looks so bright and flavorful! I have made Julia's dish and it is great..Like your addition..of the rosted cherry tomatoes.. Wanted to say I made your chicken w/ the mustard sauce last night over a small portion of egg noodles and it was very good. I just found dinner for tonight…sounds wonderful. Thank you. This looks absolutely perfect. I want it for dinner! Love all of those tomatoes! Killer pasta, Kevin! Your blog is always a feast for the eyes and I like your riff on Julia's popular pasta dish. I must try your version soon! Thanks for sharing and have a great weekend! This is a great recipe! I love creamy pasta dishes, YUM! Kevin, I love this pasta dish! and yes to cooking with wine!! really enhances the flavor!!! love this! Kevin, dude, you seriously make gorgeous looking food. . 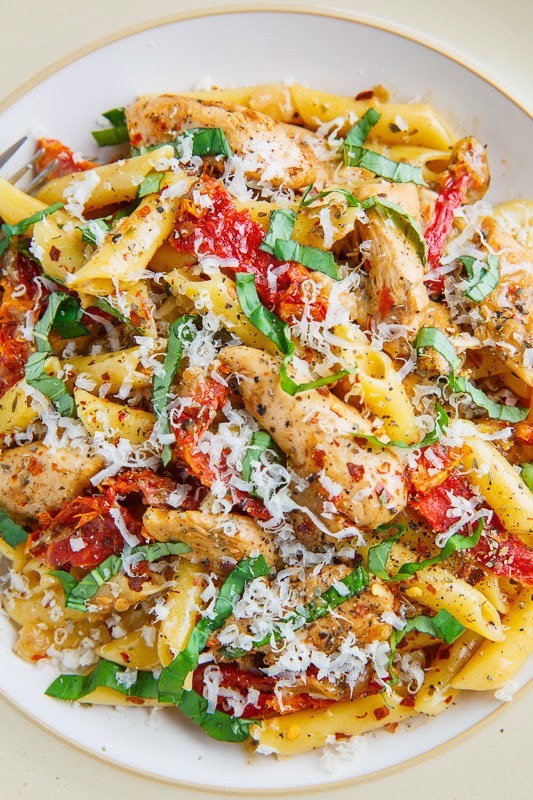 I never saw the chicken and sun dried tomato pasta on Pinterest so thanks for sharing!!! Making this!!! The only time I get anything remotely close to this is at the Olive Garden and this looks so much better.